Your feet is burning, aching and painful with every step. Most common and often first diagnosis that comes to mind for physicians is Plantar Fascitis or Heel Pain Syndrome. Let's step back a little bit and go up a little higher. Those symptoms can also mean many other things, but one should look at the diagnosis of tarsal tunnel syndrome and / or medial calcaneal nerve neuritis. With the advent of minimalist shoes, heel pain as well as tarsal tunnel syndrome has been more prevalent in my practice. Just as carpal tunnel syndrome is caused by overuse and repetitive motion of the hands and wrist, the tarsal tunnel can be aggravated via overuse and unprotected repetitive motion. 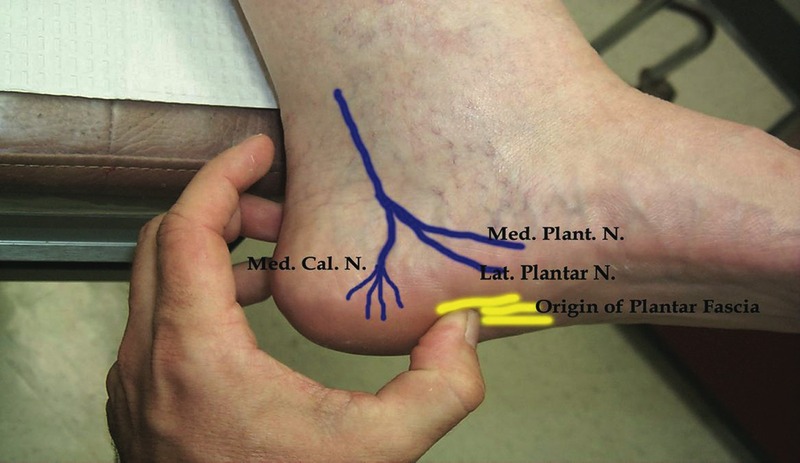 Clinical diagnosis is key with positive a Tinel's sign, or shooting pain when the nerve is tapped with the finger of a practitioner about the medial (inside) of the ankle. EMG and Nerve conduction studies can be done but they are very inaccurate for early stages of this condition. These neurological tests will only pick this compression neuropathy up when the disease has progressed to involve some muscle wasting. Clinical suspicion and evaluation is the key to a diagnosis. Then there is a nerve that goes right to the bottom of the heel causing pin point tenderness, but this also there can be pain along the inside of the heel. The nerve that supplies this area can be inflammed by trauma or chronic irritation. Clinical exam is the key once again. 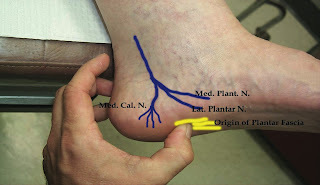 The medial calcaneal nerve is drawn below for illustration purposes. If you have been treated for plantar fascitis but you continue to have pain and notice some burning pain along the side of the ankle, you just may have Tarsal Tunnel Syndrome and / or Medial Calcaneal Neuritis. Therapy, injections, supplements such as: NeurX can help to control the symptoms. If the symptoms persists you should consult with your Podiatrist. At the Family Foot and Leg Center, we have a center for peripheral neuropathy excellence. Surgery is often very successful if done early before nerve degeneration / damage. 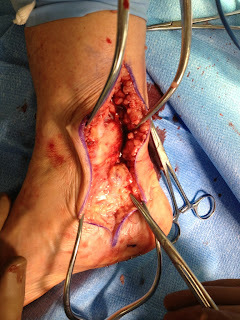 Initial incision into the tarsal tunnel, notice the bulging vein and nerve. Compression caused by deep fascia that holds your tendons and muscles in place. Patient above had surgery today with immediate relief of her heel and shooting ankle pains. Updates will be done. Post operative course will involve taking NeurX twice a day as well as immobilization for 2 weeks to allow for proper skin healing. Followed up with use of a walking boot for another 2 wks. Visit www.NaplesHeelPain.com for more information and stretching excercises for your condition. Often times surgery is required, just like carpal tunnel it will not go away with medication it is a physical constriction on the nerve itself. Medications and injections are mostly temporary. Yes TTS can send symptoms to the bottom of your foot the nerves to all the way into your toes. is there a certain kind of shoe that will help with the tarsal tunnel syndrome? i been in pain for 6 month,it gets to the point i cant walk sometimes.surgery is out of the question. Neuropathy is the most complex activity of the body as body is at stake of movement and pain is also an hindrance in our proper movement. In this case, I suggest to the patients that they must have a visit at Physiotherapy North Ryde to get relief from pain for longer duration as compared to medication.